(Honolulu) – A large panel van, full of hundreds of pounds of construction debris was towed from alongside the coastline at east O‘ahu’s Maunalua Bay this afternoon. The truck sporting graffiti, broken windows, and flat tires was apparently towed to the bay’s parking lot several months ago and abandoned. 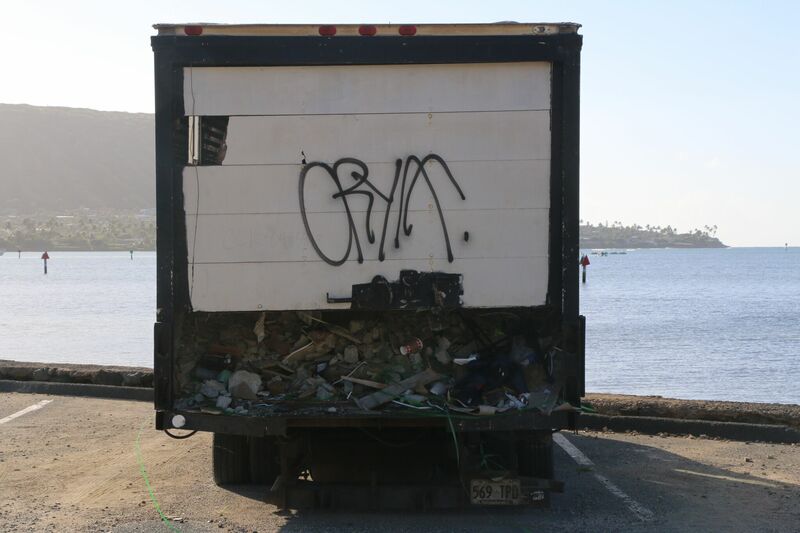 The DLNR Division of Boating and Ocean Recreation (DOBOR) posted the truck as abandoned on Oct. 31st and that triggered notification to the last registered owner who did not respond to multiple parking tickets, certified letters, a notice posted on the truck’s windshield or attempts to track her down. The State hired a contractor to shovel small and large pieces of concrete and other construction debris out of the back of the truck. The weight of the rubbish made it impossible to tow it without everything being removed. That process, one shovel at a time, took nearly five hours and cost $2500. The towing was done by a company that has an existing tow contract with DOBOR.